Home » Directories » Buyer's Guide » Analog Devices Inc.
Richardson RFPD Inc. announced the availability and full design support capabilities for a new RF transceiver from Analog Devices Inc. (ADI). Analog Devices Inc. (ADI) announced a state-of-the-art synthesizer consisting of a phase-locked loop (PLL) with fully integrated voltage controlled oscillator (VCO) as well as integrated low dropout regulators (LDO) and integrated tracking filter technology. Analog Devices Inc. (ADI) announced the acquisition of Symeo GmbH, a privately held company based in Munich that specializes in radar hardware and software for emerging autonomous automotive and industrial applications. Analog Devices, Inc. announced a collaboration with The Cornucopia Project and ripe.io to explore the local food supply chain and use this work as a vehicle for educating students at ConVal Regional High School in Peterborough, N.H., and local farmers on 21st century agriculture skills. Analog Devices, Inc. (ADI) announced that it has become an affiliate member of Mcity at the University of Michigan. Mcity is a public-private partnership led by the University of Michigan to advance connected and automated vehicles. Analog Devices, Inc. (ADI) announced it is relocating and expanding its “Analog Garage” innovation center and corporate incubation laboratory from its current location in Cambridge, Mass. to downtown Boston. Analog Devices, Inc. and Renesas Electronics Corp. announced they are collaborating on a system-level 77/79 GHz radar sensor demonstrator to improve advanced driver assistance systems (ADAS) and autonomous vehicles. ADI’s new RF-MEMS switch technology is enabling faster, smaller, lower power, more reliable instrumentation equipment by resolving multiple performance limitations commonly attributed to relays, whose origins date to the earliest days of the electric telegraph. Analog Devices to acquire Linear Technology Corp.
Analog Devices Inc. and Linear Technology Corp., Milpitas, Calif.
Analog Devices Inc. and Linear Technology Corp. announced that they have entered into a definitive agreement under which Analog Devices will acquire Linear Technology in a cash and stock transaction that values the combined enterprise at approximately $30 billion. Analog Devices Inc. (ADI) announced it will exhibit a complete 10 Gbps E-Band solution for point-to-point radio at the IEEE International Microwave Symposium (IMS) 2016, booth 1519 in San Francisco, Calif., May 24–27. Delivering a 10 Gbps full signal chain solution is a milestone for the communication industry, enabling high bandwidth applications to operate entirely on wireless networks without the need for expensive fiber infrastructure. Analog Devices has partnered with Escape Communications Inc. to create a unique ecosystem that goes beyond components and provides a full solution for the customer. Analog Devices, Inc. introduced the HMC1127 and the HMC1126 MMIC (Monolithic Microwave Integrated Circuit) distributed power amplifiers. Covering the frequency range of 2 to 50 GHz, these new power amplifier die simplify system design and improve performance by eliminating the need for RF switches between frequency bands. Analog Devices Inc. introduced the AD9528 JESD204B clock and SYSREF generator defined to support the clock requirements for long-term evolution (LTE) and multicarrier GSM base station designs, defense electronics systems, RF test instrumentation, and other emerging wideband RF GSPS data acquisition signal chains. Analog Devices to acquire Hittite Microwave Corp.
Analog Devices and Hittite Microwave Corporation today announced that the two companies have entered into a definitive agreement whereby ADI will acquire Hittite for $78 per share in cash. The closing price of Hittite’s common stock on June 6, 2014 was $60.56 per share. Hittite Microwave Corp., a supplier of complete MMIC based solutions for communication and military markets, announces the expansion of its clocks and timing product portfolio to include a clock divider and delay management IC. The HMC988LP3E provides user selectable divider and phase adjust functions and offers best in class phase noise performance as well as rise and fall times. Hittite Microwave Corp. will feature 24 new products at the 2012 IEEE MTT-S International Microwave Symposium (IMS 2012) and Exhibition held at the Palais des Congres, Montreal, Canada, June 19-21 2012. During the exhibition, these and other Hittite Microwave products will be on display. A live product demonstration area will showcase some of the company’s latest products in our 20’ x 30’ corporate exhibit, booth #1701. Hittite Microwave Corp. announced the release of two new amplifier and three new mixer products that are ideal for microwave & millimeterwave radios, military sensors, test & measurement equipment and SatCom applications from 24 to 46.5 GHz. Hittite Microwave Corp. has recently expanded its DC Power Conditioning product line with the new HMC980, a High Current, Active Bias Controller die ideal for amplifier power management. Hittite Microwave Corp. announces the release of the highly integrated HMC6000/6001 silicon transceiver chipset which targets 60 GHz applications such as: metrocell/picocell backhaul, WiGig (IEEE 802.11ad) multi-Gbps solutions including wireless cable replacement (HDMI, USB 3.0, DisplayPort), wireless docking stations, video/magazine kiosks and wireless sensors. Hittite Microwave Corp. has developed a new broadband time delay/phase shifter that is ideal for clock chain and skew adjustment in 10G-RZ, 40G/100G RZ-DQPSK fiber optic applications. This article is intended to provide insight into the effective operation of variable gain amplifiers (VGA) in automatic gain control (AGC) applications. Analog Devices, Inc. (ADI) introduced a 28 nm digital-to-analog converter (DAC) as part of a series of high speed DACs. The AD9172 meets the demands of gigahertz bandwidth applications and delivers the increased spectral efficiency needed for 4G / 5G multi-band wireless communications base stations and 2 GHz E-Band microwave point-to-point backhaul radios. Its design benefits production instrumentation targeting multi-standard direct-to-RF signal synthesis and provides a solution for defense electronics requiring greater detection range. Analog Devices, Inc. announced a pair of high-performance GaN power amplifier (PA) modules which offer one of the highest power-density levels in their class, thus minimizing size and weight of the subsystem. The HMC7885 and HMC7748 broadband modules target applications operating between 2 GHz and 6 GHz, including test and measurement, communications, Traveling Wave Tube (TWT) replacement, military/aerospace surveillance and countermeasures and radar. Analog Devices Inc. (ADI) announced the Drive360™ 28 nm CMOS RADAR technology platform that builds on its established ADAS (Advanced Driver Assistance Systems), MEMS, and RADAR technology portfolio widely used throughout the automotive industry for the past 20 years. Analog Devices is the first to offer automotive RADAR technology based on an advanced 28 nm CMOS process. Analog Devices Inc. introduced a breakthrough in switch technology that provides a long-sought replacement for electromechanical relay designs. The first in a product series, ADI’s ADGM1304 and ADGM1004 RF MEMS switches are 95 percent smaller, 30 times faster, 10 times more reliable, and use 10 times less power than conventional electromechanical relays. Analog Devices Inc. introduced a low power, high performance, radio transceiver for battery powered applications. The transceiver enables more reliable wireless radio connections with fewer retries and packet losses as well as longer battery lifetime. The ADF7030-1 features a highly sensitive receiver and superior immunity to signal interference as well as low power modes, including the industry’s lowest current in sleep mode. The ADA4522-1 / ADA4522-2 / ADA4522-4 are single/dual/quad channel, zero drift op amps with low noise and power, ground sensing inputs, and rail-to-rail output, optimized for total accuracy over time, temperature, and voltage conditions. The wide operating voltage and temperature ranges, as well as the high open-loop gain and very low DC and AC errors make the devices well suited for amplifying very small input signals. Analog Devices Inc. introduced a high-performance clock jitter attenuator designed to support the JESD204B serial interface standard for connecting high-speed data converters and field-programmable gate arrays (FPGAs) operating in base station designs. The HMC7044 delivers 50-fs jitter performance, which improves the signal-to-noise ratio and dynamic range of high-speed data converters, and the device provides 14 low-noise and configurable outputs. The AD5592R and AD5592R-1 have eight I/Ox pins (I/O0 to I/O7) that can be independently configured as digital-to-analog converter (DAC) outputs, analog-to-digital converter (ADC) inputs, digital outputs, or digital inputs. AD5592R and AD5592R-1 have an integrated 2.5 V, 25 ppm/°C reference, which is turned off by default, an integrated temperature indicator, which gives an indication of the die temperature and are available in 16-ball, 2 mm x 2 mm WLCSPs and 16-lead, 3 mm x 3 mm LFCSPs. Analog Devices Inc. announced an integrated direct conversion receiver development platform for radar systems where reduced size, weight and power (SWaP) implementation is critical. The AD-FMCOMMS6-EBZ platform is a 400 MHz to 4.4 GHz receiver (1350 to 1650 MHz with installed filters) supporting the key L- and S-band frequency radar bands. The ADF4355-2 allows implementation of fractional-N or integer-N phase-locked loop (PLL) frequency synthesizers when used with an external loop filter and an external reference frequency. ADF4355-2 has an integrated VCO with a fundamental output frequency ranging from 3400 MHz to 6800 MHz. The VCO frequency is connected to divide by 1, 2, 4, 8, 16, 32, or 64 circuits. The ADF5355 allows implementation of fractional-N or integer-N phase-locked loop (PLL) frequency synthesizers when used with an external loop filter and an external reference frequency. The wideband microwave VCO design permits frequency operation from 6.8 to 13.6 GHz at one radio frequency (RF) output. Control of all on-chip registers is through a simple 3-wire interface. Analog Devices Inc. released the industry’s first software-defined radio (SDR) rapid prototyping kit with dual 2 x 2 AD9361 RF transceivers to simplify and rapidly prototype 4 x 4 multiple-input multiple-output (MIMO) wireless transceiver applications on the Xilinx® Zynq®-7000 All Programmable SoC development platforms. The AD-FMCOMMS5-EBZ rapid prototyping kit provides a hardware/software ecosystem solution. The HMCAD1104is a 10-bit octal channel ADC which offers an industry best combination of low power and high performance. Operating at 65 MSPS, the HMCAD1104delivers a signal to noise ratio (SNR) of 61.6 dB. Hittite has also released the HMCAD5831LP9BE 3-bit ADC. This wideband ADC is targeted to extreme applications in radar, radio astronomy, and test and measurement equipment. Hittite Microwave Corporation, the world class supplier of complete MMIC based solutions for communication & military markets, has launched HMC1048LC3B, a new double-balanced mixer product which is ideal for microwave and VSAT radios, sensors, test equipment and military & space applications. Hittite Microwave Corporation, the world class supplier of complete MMIC based solutions for communication & military markets, has released a new Broadband High IP3 Downconverter RFIC which operates from 700 to 3500 MHz. The HMC1090LP3E is ideal for space constrained frequency conversion applications in wireless infrastructure equipment. The HMC952 and the HMC952LP5GEare four stage GaAs pHEMT MMIC 2 W medium power amplifiers with temperature compensated on chip power detectors which operate between 9 and 14 GHz. These amplifiers provide 33 dB of gain, +35 dBm of saturated output power, and 27% PAE (Power Added Efficiency) from a +6 V supply. Hittite Microwave Corp., the world class supplier of complete MMIC based solutions for communication & military markets, is pleased to announce the release of the May 2012 Selection Guide which summarizes over 1025 products including 21 new products. Hittite Microwave Corp. has expanded its Broadband Time Delay/Phase shifter portfolio adding the HMC911LC4B, which is ideal for 10G, 40G RZ-DQPSK, 100G DWDM RZ Carver clock chain and skew adjustments in the fiber optic domain. The HMC911LC4B is a DC to 24 GHz Broadband Time Delay product that provides a continuously variable delay from 0 ps to 70 ps. New DC to 700 MHz, 10 kOhm TIA for Laser Sensor Applications. 65 dB Dynamic Range & 150 nA Input RMS Noise over 700 MHz Bandwidth. Ideal for RF transmitter power amplifier control and RSSI measurement in cellular basestations, radio links and radar. The HMC680LP4E is a high linearity, CMOS/ TTL compatible digitally controlled variable gain amplifier (DVGA) which operates from 30 to 400 MHz, and can be programmed to provide from -4 dB to 19 dB of gain, in 1 dB steps. The HMC680LP4E is housed in a 4x4 mm QFN leadless package and delivers noise figure of 5 dB in its maximum gain state. Hittite has launched six new high speed logic products to complement our growing high speed logic product line. The HMC637 is a GaAs pHEMT MMIC Power Amplifier chip which is rated from DC to 6 GHz, and delivers 14 dB gain, +30 dBm saturated output power, and +41 dBm output IP3. The HMC637 also delivers consistent output IP3 and excellent gain flatness of ±0.6 dB across its rated bandwidth. The HMC451LP3E is a highly efficient, GaAs PHEMT MMIC medium power amplifier which operates from 5 to 18 GHz. The amplifier provides 18 dB of gain and +21 dBm of saturated output power at 18% PAE, while consuming only 120 mA from a +5 V supply. The HMC614LP4E provides a "true RMS" representation of any RF/IF input signal and is ideally suited to wide bandwidth, wide dynamic range applications requiring repeatable power measurement over temperature; and especially where RF/IF waveshape and crest factor change with time. The HMC616LP3E, HMC617LP3E and HMC618LP3E are GaAs pHEMT MMIC Low Noise Amplifiers which are rated from 175 to 660 MHz, 550 to 1200 MHz, and 1700 to 2200 MHz, respectively. These high linearity LNA MMICs deliver up to 24 dB gain and +37 dBm output IP3, with noise figure as low as 0.5 dB. The HMC663LC3 is a general purpose, double-balanced mixer that is housed in a 3x3 mm ceramic SMT package and can be used as an upconverter or downconverter. Optimized balun structures allow the HMC663LC3 to provide up to 42 dB of LO to RF and LO to IF isolation, while conversion loss is specified at only 8 dB across the frequency range of 6 to 12 GHz. Ideal for optical receivers, the HMC750LP4E provides 11 GHz of bandwidth, 2 mV p-p input sensitivity, and very low RMS jitter degradation. The HMC599ST89E is a GaAs pHEMT based, Wide Dynamic Range Gain Block MMIC Amplifier which is rated from 50 to 960 MHz and delivers 14 dB gain, +39 dBm output IP3, and noise figure as low as 2 dB. The HMC714LP5E is a dual-channel RMS power detector designed for high accuracy RF power signal measurement and control applications from 0.1 to 3.9 GHz. Hittite has released the HMC720LC3C 1:2 Fanout Buffer, the HMC721LC3C XOR/XNOR gate, the HMC722LC3C AND/NAND/OR/NOR function, and the HMC723LC3C D-Type Flip Flop. These devices are designed to support data/clock rates up to 13 Gbps/13 GHz. The differential inputs to these devices are terminated with 50 Ohms to ground on chip, and may be either AC or DC coupled, while the differential outputs may be either AC or DC coupled. Rated from 0.6 to 1.4 GHz, and 1.3 to 2.9 GHz respectively. Specifically designed to help synthesizer designers select the best Hittite Divider, Phase Frequency Detector and VCO for their PLL circuit needs. Hittite Microwave offers the HMC614LP4E and the HMC714LP5E , the first single and dual integrated RMS power detectors capable of simultaneously measuring the instantaneous (RF envelope) power and true RMS power while providing a direct read of signal crest factor. Differential input sensing range is up to 72 dB to ±1 dB detection accuracy. Hittite Launches New Limiting Amplifier Product Line. Ideal for OC-192, 10 Gbps Ethernet & Fiber Channel Receivers. New Active and Passive Multipliers to 90 GHz. Ideal for Microwave & Millimeterwave Radio, Clock Generation & Test Equipment Applications. Hittite Announces Fast Rise/Fall Time Logic. Four New Logic Devices Support Data Rates to 13 Gbps with Rise/Fall Times as Fast as 15 ns. New High Frequency MMIC VCOs Feature Dual Outputs. High Output Power and Low Phase Noise VCOs for X & Ku Band Applications! Hittite Launches 6 High Speed Logic Circuits! Ideal for Broadband Instrumentation, Optical Systems, Radar, Frequency Synthesis & ATE. Hittite Microwave Corp., the world class supplier of complete MMIC based solutions for communication & military markets, has introduced a new wideband power amplifier module for use in microwave radio, VSAT, military & space, fiber optic and broadband test equipment applications from 100 MHz to 20 GHz. High Performance GaAs MMIC I/Q Upconverters Span 11 to 21 GHz! Upconverters deliver up to +30 dBm Output IP3 & -20 dB Sideband Rejection. These miniature hermetically sealed modules feature 1.85 mm connectors, operate from -40°C to +70°C, and consume between 560 and 690 mW from a -3.3V DC supply. The HMC-C060, HMC-C061, HMC-C064 and the HMC-C065 exhibit propagation delays of less than 230 ps with only 2 ps of deterministic jitter and rise/fall times of less than 10 ps. 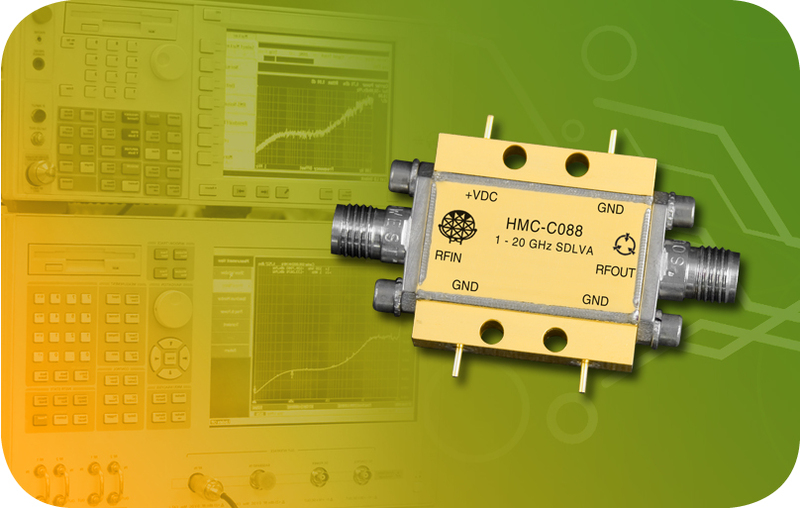 Hittite has introduced a new GaAs HEMT MMIC low noise amplifier die, the HMC-ALH508, which will allow designers to address E-band applications from 71 to 86 GHz. The HMC-ALH508 LNA die is ideal for automotive radar, military and space applications, wireless LANs, and ultra high capacity E-band communication systems. Hittite Microwave Corporation, the world class supplier of complete MMIC based solutions for communication & military markets, has launched the HMC-T2100, a new, easy to implement 10 MHz to 20 GHz Synthesized Signal Generator which provides the highest output power, lowest harmonic levels and broadest frequency range compared with any signal generator in its class for only $7,998.00. Hittite Microwave Corp., the world class supplier of complete MMIC based solutions for communication & military markets, has introduced two new wideband direct I/Q modulators which are ideal for automotive, broadband, cellular/3G, WiMAX/4G, military and test & measurement equipment applications between 20 and 4000 MHz. New Non-Reflective MMIC SPDT Module covers DC to 18 GHz. Ideal for Test & Measurement, Fiber Optics, Military & Space Applications. For Cellular/3G & WiMAX/4G Infrastructure. Three New LNAs Support High Linearity Applications from 230 to 2200 MHz. High Linearity, Wide Range VVAs Target Microwave & VSAT Radios. Die & SMT Voltage Variable Attenuators Operate from 5 to 30 GHz. The HMC-C062 is a fanout buffer designed to support data transmission rates of up to 50 Gbps. The device can also operate with clock signals up to 30 GHz. The input is broadband from DC to 30 GHz. During normal operation, input data (or clock) is transferred to both output channels. Differential input signals to the HMC-C062 are terminated with 50 Ohms to ground on-chip, and may be either AC or DC coupled. Hittite Extends PLL Fractional-N Synthesizers to 14 GHz. Two New Low Noise Synthesizer ICs Include Integrated Sweeper Function. Hittite Microwave Corporation, the world class supplier of complete MMIC based solutions for communication & military markets, has expanded its Power Detector product line to include a new Wideband Logarithmic Detector which is ideal for a wide range of applications including point-to-point microwave radio, VSAT, test & measurement and more. New Double-Balanced Mixers Deliver IIP3 up to +40 dBm. New High Linearity Mixer Family is Ideal for Cellular/4G Infrastructure Transceivers. New HBT Driver Amplifier for Cellular/3G and WiMAX/4G Applications Delivers up to +27 dBm Output Psat from 700 MHz to 2.8 GHz. Hittite Microwave Corporation, the world class supplier of complete MMIC based solutions for communication & military markets, has introduced a new GaAs HBT Ultra Low Phase Noise Amplifier module which is ideal for high performance applications in microwave radio, military & space, radar systems, test instrumentation and synthesizers from 6 to 12 GHz. Hittite Microwave Corp., the world class supplier of complete MMIC based solutions for communication & military markets, has introduced a new GaAs pHEMT MMIC SP4T switch module which is ideal for use in microwave radio, VSAT, military & space, fiber optic and broadband test applications from DC to 20 GHz. Hittite Microwave Corp., the world class supplier of complete MMIC based solutions for communication & military markets, has introduced three new SMT packaged GaAs pHEMT/HEMT MMIC low noise amplifiers (LNAs) which are ideal for microwave radio, VSAT, military & space, sensors and test instrumentation applications from 2 to 28 GHz. Hittite Releases I/Q Mixer/IRM for 10 to 16 GHz Microwave Radio & VSAT Applications. New I/Q Mixer is ideal as IRM or SSB Upconverter. New SMT Mixer Targets 6 to 26 GHz Up/Downconversion Applications. Wide IF Bandwidth is ideal for Microwave Radio, Military & Space, VSAT & Test. Hittite Launches New ½ Watt & 1 Watt MMIC Power Amplifiers for High Linearity Tx Chains. Ideal for Microwave Radio, Military & Space, VSAT & Test Applications from 16 to 24 GHz. Wideband LNAs for Microwave/mmWave Radio, Military & Test. Four New LNAs Support High Dynamic Range Applications from 1 to 36 GHz. Introducing four new GaAs pHEMT/HEMT MMIC Low Noise Amplifiers (LNAs) which are ideal for microwave and millimeterwave radio, VSAT, military & space, test instrumentation and sensor applications from 1 to 36 GHz. PLL with integrated VCO product line enables miniature LO solutions. Industry’s first fractional-N synthesizers with integrated microwave VCOs to 13.4 GHz. Hittite launches industry leading commercial DRO product line. Targets X-band applications with -124 dBc/Hz phase noise at 10 KHz offset. Introducing its first high performance dielectric resonator oscillator (DRO). An exciting new product, the HMC-C200 is one of the lowest phase noise X-band DRO products in the industry. Three new SMT comparators deliver 20 Gbps speed at less than 150 mW power dissipation: the HMC874LC3C, the HMC875LC3C and the HMC876LC3C. Hittite Microwave Corporation, the world class supplier of complete MMIC based solutions for communication & military markets, has introduced a new passive GaAs MMIC Fundamental Mixer die, the HMC773, which will allow designers to address applications from 6 to 26 GHz. The HMC773 die is ideal for microwave radio, VSAT, military and space applications, test equipment and sensors. Hittite’s New Power Detector is Ideal for High Volume 3G/4G Infrastructure. 54 dB Log Detector/Controller Operates from 50 MHz to 8 GHz. Hittite Microwave Corporation, the world class supplier of complete MMIC based solutions for communication & military markets, has introduced the HMC-C070 MicroSynth™ product, which is a fully integrated broadband synthesizer module. Operating from 5.5 to 10.5 GHz, the HMC-C070 MicroSynth™ delivers excellent phase noise performance. Hittite Microwave Corporation, the world class supplier of complete MMIC based solutions for communication & military markets, has introduced eight new SMT packaged PLLs with Integrated RF Voltage Controlled Oscillators (VCOs) which are ideal for Cellular Infrastructure, Broadband, LTE/4G and test equipment applications from 660 MHz to 5.1 GHz. Hittite Microwave Corporation, the world class supplier of complete MMIC based solutions for communication & military markets, has introduced two new SMT packaged high resolution 6-Bit and 7-bit Digital Attenuators which are ideal for automotive, broadband, cellular/3G, WiMAX/4G, military and test & measurement equipment applications from DC to 6 GHz. Hittite Microwave Corporation, the world class supplier of complete MMIC based solutions for communication & military markets, has launched two new low cost, highly flexible RMS Power Detectors for RF power measurement/control in Cellular/3G, LTE/WiMAX/4G, broadband, test equipment and military applications between DC and 5.8 GHz. SPDT T/R switch is ideal for high power transceivers. New 10 W T/R switch covers cellular/3G and WiMAX/4G applications to 4 GHz. New Power Amplifier is Ideal for WiMAX and LTE/4G Application. New Surface Mount PA Features High Efficiency and Low EVM. New Power Amplifiers are Ideal for Military and Microwave Radio Applications. Two New PA Die Deliver High Gain and High Power Added Efficiency. Hittite Microwave Corporation, the world class supplier of complete MMIC based solutions for communication & military markets, has launched the HMC-T2100B, the first battery powered, 10 MHz to 20 GHz Portable Synthesized Signal Generator. Designed to fulfill signal generation needs in the field or on the bench, and priced at only $14,998. High Performance GaAs MMIC Upconverter Covers 17.7 to 23.6 GHz. New Sub-Harmonic Upconverter Features High Conversion Gain and Wide IF Bandwidth. Hittite Microwave Corporation, the world class supplier of complete MMIC based solutions for communication & military markets, announces the release of a ceramic SMT packaged GaAs pHEMT SP4T (Single Pole, Four Throw) MMIC Switch which is ideal for industrial sensors, test and measurement, microwave radio, military EW and space applications from DC to 20 GHz. New 0.6 to 20 GHz SDLVA Features RF Limited Inputs & 250 V ESD Rating. 4 x 4 mm SMT Package is Ideal for Space & Power-Constrained Applications. Hittite's MMIC band pass filter chip tunes from 19 to 38 GHz with new tunable MMIC filter that occupies only 3 mm2. This analog voltage tuned, solid state MMIC filter is insensitive to environmental conditions, and represents a space saving alternative to mechanically tuned and MEMS based filter solutions. Hittite Microwave Corp. announces the release of a new market leading PLL chip set. The HMC983LP5E DC to 7 GHz Fractional-N divider and frequency sweeper and the HMC984LP4E digital phase-frequency detector and charge pump form a high performance PLL chip set solution targeted at PLL and frequency modulated continuous wave (FMCW) sweeper applications requiring ultimate performance. Time-delay/phase shifter delivers 500° over 8 to 23 GHz and is ideal for fiber optic clock & LO synchronization applications. Hittite Microwave Corp. offers a wideband GaAs pHEMT MMIC Distributed Power Amplifier die which is ideal for military EW, test & measurement equipment, and broadband telecom equipment applications up to 48 GHz. HMC1022 is a 0.25 W GaAs pHEMT MMIC amplifier which operates between DC and 48 GHz. Hittite announces the release of the HMC6383 , a high-performance, flexible, direct conversion receiver (DCR) radio design platform that can be configured on-the-fly. Fully field programmable, the HMC6383 platform is designed to serve as a receiver subsystem building block for various applications including cellular basestations, microwave radio, adaptive IF strips, wireless LAN, software defined radio and test equipment. New Mux & Demux for broadband test, ATE, FPGA & DAC interfacing. They support data serialization & deserialization respectively, up to 32 Gbps. Hittite Microwave Corporation, the world class supplier of complete MMIC based solutions for communication & military markets introduces five new SMT packaged MMIC Band-Pass Tunable Filters which are ideal for pre-selection applications in wideband test and measurement equipment, communication systems and electronic warfare (EW) subsystems up to 37.0 GHz. Hittite Microwave Corporation, the world class supplier of complete MMIC based solutions for communication & military markets, has introduced two new SMT packaged MMIC 5-Bit Digital Attenuators which are ideal for automotive, microwave radio, test equipment, military and space applications up to 33 GHz. Widest bandwidth SMT digital attenuators operate to 33 GHz. Hittite Microwave Corporation, the world class supplier of complete MMIC based solutions for communication & military markets is featuring a new set of octal 12-bit Analog-to-Digital Converters, the HMCAD1102, HMCAD1101 and HMCAD1100 which complements Hittite’s ultra low power ADC products. Hittite Microwave Corp., the world class supplier of complete MMIC based solutions for communication & military markets, announces the release of two new SMT packaged GaAs MMIC variable gain amplifiers (VGAs) which are ideal for VSAT, microwave radio, military, and test & measurement equipment applications from 5 to 27 GHz. New industry leading wideband PLL with integrated VCO. Low phase noise & low spurious characteristics are ideal for software defined radios. New GaN MMIC power amplifier delivers 10 W from 10 MHz to 10 GHz. New 0.5 to 18.5 GHz SDLVA features 67 dB logging range & 250V ESD rating that is available in a compact 4 x 4 mm plastic SMT package. Hittite has introduced the first product in the new automatic gain control product line. The HMC992LP5E combines a high performance analog voltage variable attenuator (VVA) core with a high speed power detector in a compact 5 x 5 mm plastic package to offer a complete, compact automatic gain controller (IF-AGC) solution. Hittite Microwave Corporation, the world class supplier of complete MMIC based solutions for communication & military markets, has launched the HMC-T2220, a new and easy to implement 10 MHz to 20 GHz Synthesized Signal Generator which provides the highest output power, lowest harmonic levels and broadest frequency range compared with any signal generator in its class for only $9,998.00. Hittite Microwave Corp., the world class supplier of complete MMIC based solutions for communication & military markets has expanded its power detector product line by releasing a new 54 dB dynamic range, millimeterwave logarithmic detector capable of operation over a wide frequency range spanning 1 to 23 GHz. Hittite introduces four new SMT passive attenuator pads For DC to 25 ghz applications. These innovative SMT attenuator pads are the perfect solution for a wide range of applications including microwave radio, military subsystems, fiber optics, scientific instruments and sensor applications up to 25 GHz. New 12.5 Gbps Limiting Amplifier with Loss-of-Signal Detection. Ideal for SONET/SDH-based Transmission, 10 GbE, 8x/10x Fiber Channel & OC-192 F/O Modules. Hittite Microwave Corporation, the world class supplier of complete MMIC based solutions for communication & military markets, has introduced a new series of GaAs HBT Ultra Low Phase Noise Amplifier modules which are ideal for high performance applications in microwave radio, military & space, radar systems, test instrumentation and synthesizers from 1.5 to 11 GHz. Expanded to provide a user friendly interface for programming Hittite's family of interface driver/controllers, digital attenuators, and variable gain amplifiers. This kit allows the designer to set desired attenuation & gain states, toggle between serial and parallel control modes, and construct custom serially clocked input signals. Hittite Microwave Corporation, the world class supplier of complete MMIC based solutions for communication & military markets, is announcing our newest instrumentation product, the HMC-T2240. Priced at only $19,498.00, the HMC-T2240 is a 10 MHz to 40 GHz Synthesized Signal Generator which provides the highest output power, lowest harmonic levels and broadest frequency range compared with any signal generator of its size and cost. New Tri-Band Frequency Synthesizers with Integrated VCO. Fractional-N Synthesizers with Auto-Calibrated, Wideband VCO. Hittite’s 25th product line, tunable filters, are ideal for pre-selection in multi-band communication systems, wideband radar, & test and measurement equipment. Features 31 new products with full descriptions, features and applications on each product.